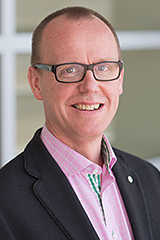 Johan Wiklund is the Al Berg Chair and Professor of Entrepreneurship at Whitman School of Management, Syracuse University, USA, Professor Two at Nord University, Norway, Visiting Professor at Lund University, Sweden, and inaugural RMIT Fulbright Distinguished Chair in Entrepreneurship and Innovation in Australia. His research interests include entrepreneurship and mental health as well as the entry, performance, and exit of entrepreneurial firms. He is considered a leading authority in entrepreneurship research with over 60 articles appearing in leading entrepreneurship and management journals and over 17,000 citations. He is incoming Editor-in-Chief for Entrepreneurship Theory and Practice, and previously editor for Journal of Business Venturing and Small Business Economics. A prolific advisor of Ph.D. students, he received the Academy of Management Entrepreneurship Division Mentor Award in 2011. Professor Wiklund's research interests include entrepreneurship and mental health as well as the performance, growth, exit, and failure of entrepreneurial firms.